Cupping is a non-invasive method to relive local congestion on the external surface of the underlying condition with application of concept of vacuum which is created either by heat or by suction. Documentations of its history begin from 1550 BC with the Egyptian civilization and then passing on the Greek region during Hippocrates which further followed towards the east through the Arab civilization by Avicenna and was imbibed with religious inference during the reign of Prophet Mohamed (PBUH) which further fragranced into the silk route and had its roots to ancient Chinese civilization and presently being practise as a modality in traditional, complementary and alternate medicine. It is termed as Hijama (حجامة) which means sucking in Arabic. Cupping is used for the treatment of diseases of the blood, and as a therapeutic measure. 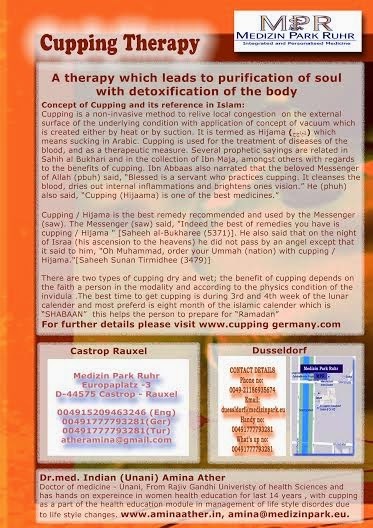 Several prophetic sayings are related in Sahih al Bukhari and in the collection of Ibn Maja, amongst others with regards to the benefits of cupping. Ibn Abbaas also narrated that the beloved Messenger of Allah (pbuh) said, “Blessed is a servant who practices cupping. 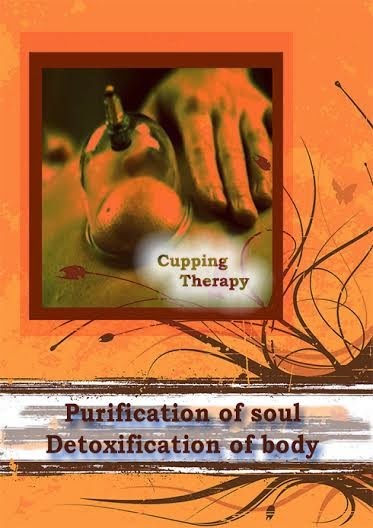 Cupping / Hijama is the best remedy recommended and used by the Messenger (saw). The Messenger (saw) said, “Indeed the best of remedies you have is cupping / Hijama ” [Saheeh al-Bukharee (5371)]. Doctor of medicine – Unani Medicine , From Rajiv Gandhi University of Health Sciences and has hands on experience in women health education for last 14 years , with cupping as a part of the health education module in management of life style disorders due to life style changes. Our thanks to Dr Amina Ather from Germany for sharing the above post. If you have any questions for Dr Ather or have been treated by her and want to leave her a testimonial, then please do so via a comment* below.